While I agree with your last statement--but who ever said innovating successfully would be easy?--you may have to expand on your earlier point about social media, marketing and customer service. In the end, if social is to be a platform for business, it will take collaboration from marketing and customer service, but it will require leadership from product or channel management. 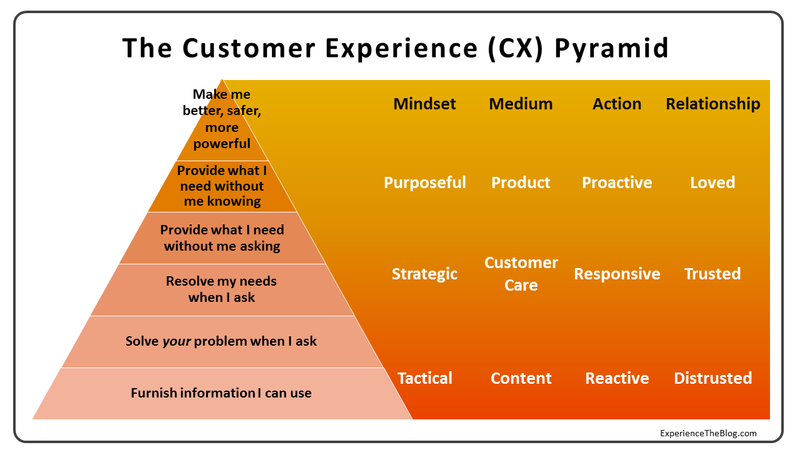 But in the interim, advertising is not in the CX Pyramid, Content is at the bottom, and Customer Care is high up. 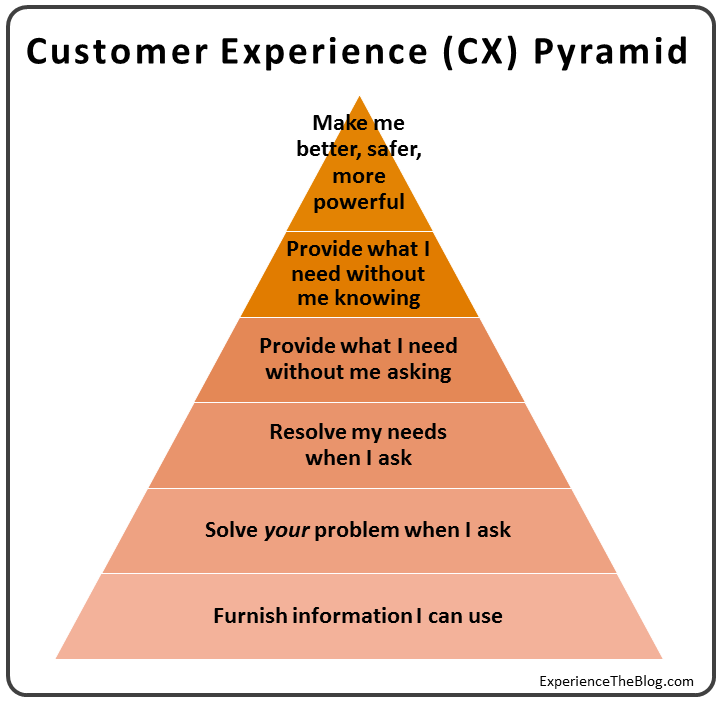 It seems to me Customer Care may be better equipped to deliver the sorts of experiences that serve needs higher in the pyramid. Excellent insights, Augie. I've come to appreciate your point, that companies should: "begin their Customer Experience design in a different place--not with customer perception of existing products and services but with an understanding of consumers' evolving needs and expectations". Most VoC/listening posts and journey mapping falls short of this: discovering what customers are ultimately trying to get done through a product/service -- what is their job-to-be-done, or the capability they're seeking. This provides context for everyone in the company. These are 2 earth-shattering principles for the CX field. Also to your points about backward-looking, reactive, tactical, narrow, and self-interested dimensions of CXM in-practice today, I've come to appreciate the need for managing customer experience as a living, flowing system. The CX system has a foundation of CX-aligned strategy and culture/employee engagement, and VoC informs the building blocks throughout the system: intelligence, value, systemic improvement (as opposed to piecemeal), innovation, and customer engagement --> and the system's outputs are customer retention, loyalty and financial gains. 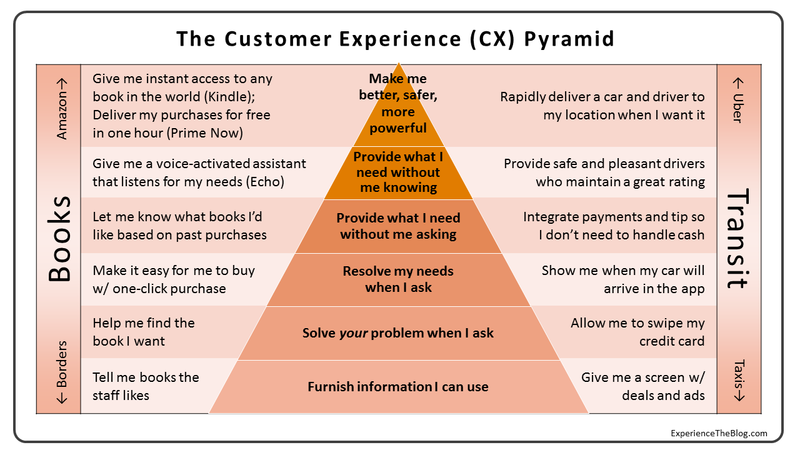 This, too is an earth-shattering principle for the CX field, as is your pyramid diagram in this article, Augie. I hope we can shift the trajectory of the CX field through this new wisdom. Thanks Lynn. It's amazing we need to keep relearning this lesson. Henry Ford didn't analyze the horse and buggy to develop incremental improvements, and today companies cannot succeed for long unless they are constantly innovating and cannibalizing their existing business model. Great article and responses, Augie and Lynn. You've hit on the central challenges constraining most CX initiatives from being truly transformative, much less successful. It's easy to get caught up in the excitement and WANT to be customer-centric, as many are experiencing (and even more will experience this year). The harder and more important part is to know WHY this needs to happen, and what's required to make it work. Being customer-centric involves more than launching a CX survey, or buying great SaaS software, or monitoring social media. It's all of these and more. It's complicated, yes, so without involvement and leadership from the highest levels, the kinds of cultural and structural changes required become deal breakers rather than deal makers. That said, keep fighting the good fight and keep the insights coming. Great stuff! I find the whole analysis and reasoning very fruitful. Just a note on the parts about Uber. In Sweden, we "always" have been able to call Taxis via phone - to a local Taxi dispatch central - and get the Taxi come to where we are. So, that is not new, in itself, to us. I immediately get an option to have sent a car to my most used pickup adress, just by Pressing #1. Very easy and swift, even if it is a "tactical" add-on.